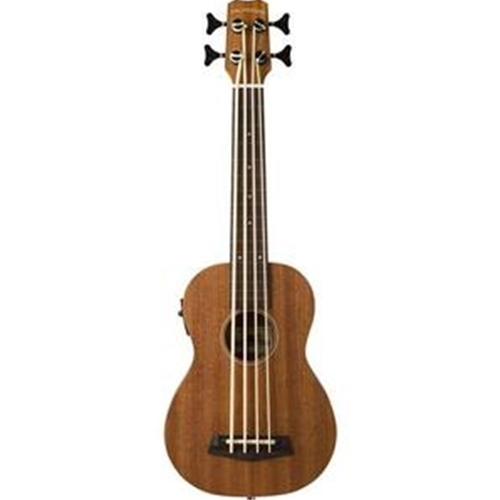 Kanile'a Ukeleles are well known for making some of the finest ukes on the market, and now they've expanded their offerings to include these incredibly fun-to-play, Islander Pako uke basses in Mahogany (M) or Flamed Mahogany (FM), and strung with the revolutionary Thundergut silicone strings by Aquila. The strings lie at the heart of the Islander's uncanny ability to sound like a full-size upright bass, even though the whole instrument could fit inside a carry-on suitcase! Of course, for the full effect, they should be amplified, but with the proliferation of compact, battery-powered amplifiers available, you could be doing your best Jaco Pastorius impression atop Diamond Head in no time!